Engraved objects are usually seen as a hallmark of cognition and symbolism, which are viewed as important features of modern human behavior. In recent years, engraved ochre, bones and ostrich eggs unearthed from various Paleolithic sites in Africa, the Near East and Europe have attracted the attention of many scholars. However, such items are rarely encountered at Paleolithic sites in East Asia. Here, we report a very important discovery of such a cultural relic. Professor Gao Xing and Dr. Peng Fei from the Laboratory of Human Evolution, Institute of Vertebrate Paleontology and Paleoanthropology under the Chinese Academy of Sciences found an engraved stone artifact in a stone tool assemblage unearthed at the famous Shuidonggou (SDG) Paleolithic site. This site is in the Ningxia Hui Autonomous Region of northwest China. This new discovery was announced in the Chinese Science Bulletin, 2012, No.26. Dr. Peng Fei, Postdoctoral Research Fellow of the University of the Chinese Academy of Sciences and first author, described the finding: “This engraved stone artifact was a recent accidental discovery during our technological analysis of the stone tool assemblage unearthed at the Shuidonggou site in 1980. 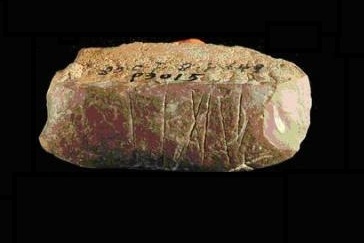 It is the first engraved non-organic artifact from the entire Paleolithic of China. Professor Gao, director of this study, stated: “The SDG Paleolithic site includes 12 localities, ranging in date from Early Late Paleolithic to Late Paleolithic. The engraved stone artifact was found at Locality 1, which is about 30 ka BP. As the first Paleolithic site discovered in China, SDG Locality 1 is distinctive in Late Paleolithic industry of north China, because of its components of elongated tool blank production and Levallois-like technology. Dr. Peng summarized some remaining findings and uncertainties. “In addition to the engraved stone artifact, one ostrich egg bead was unearthed from SDG Locality 1. The lithic assemblage of this locality includes blade production and elongated tool blanks. But at Locality 2, about 2.4.9 ka BP and very close to Locality 1, typical flake productions were found with ostrich egg beads in the same cultural horizon. The blade technology was probably introduced from the Altai region of Russian Siberia, according to comparison between lithic assemblages. The flake technology is typical of the Late Paleolithic in north China. So, who created the ostrich beads and incisions? Were they made by the populations who migrated from the west, such as from the Altai region? Or were they the result of acculturation, such that aborigines in north China learned this kind of technology from exogenous populations? Or were they created solely by the local people because of technological renovation or cognitive advancement?